The following is a list of links that I find very useful. All are included because I either support or endorse the organization involved, or the people who own the site. Is any of these links doesn't work, please let me know. This picture is from 2002. 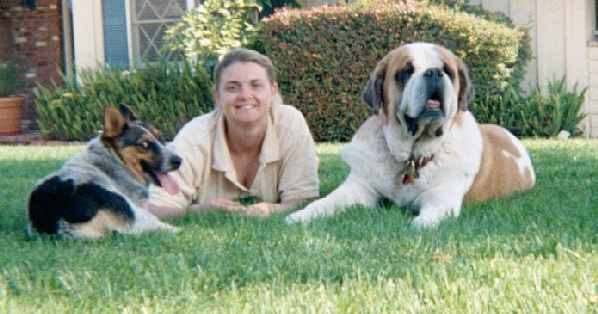 Sadly, Sparky, my Australian Cattle Dog (left) and Homer (my brother's St. Bernard, right) have crossed the rainbow bridge. North American Trail Ride Conference This national organization is one of several sponsoring competitive trail rides. Southern California is part of NATRC's Region 2. The American Endurance Ride Conference (AERC) Not only is the the AERC's website, it also contains dozens of links to all sorts of distance riding organizations, groups and resources. Society for Creative Anachronism, Kingdom of Caid (S. Calif-wide) Academy of Equestrian Arts The SCA's Medieval Equestrian group for all of Southern California. Barony of Altavia Equestrian Guild This link is to the local medieval equestrian group or guild that recently formed in the NE San Fernando Valley (Barony of Altavia). No website yet, just this newsgroup. New Hope Cattle Dogs Rescue & Rehoming A wonderful breed rescue organization for Australian Cattle Dogs, a.k.a. "Queensland Heelers" or "Blue Heelers" (place where I got Jasper, Smokey and Tayla and where my mother, Sally, adopted her red ACD named Lucy). My good friend Cheryl West Web Site Besides being my good friend, and a wonderful person, Cheryl is a practitioner of natural trim horseshoeing/farriery techniques and adopted "mom" to Azarado Cher Can, an arabian mare I raised, and to Jake, a grade arab gelding I rescued. Claudia Pequin's Equinox Acres, NW Alberta, Canada Links to Claudia's Equinox Acres website for her farm in NW Alberta. Claudia is a vet, her husband an equine dentist. Together they breed NASHA-registered single footing horses on a foundation of Rocky Mountain and Kentucky Mountain bloodlines. Lee Zeigler's gaited horse website Lee is a leading gaited breed clinician, educator, breeder and trainer. Liz Graves' Web site Liz is also a leading clinician, writer, trainer and breeder of gaited horses of all kinds. CLICK HERE to check out Amber Applegates "Applegait'n Endurance Horses"
Amber is a fellow convert to NASHA Single Footers like me...she also happens to be blowing the socks of the competition in AERC limited distance and 50-mile endurance rides with her NASHA-registered half TWH, half Rocky Mountain horse named "Equinox D'Artagnon" from the same Equinox Acres farm in Alberta, Canada that bred Equinox Beauty and Equinox Shir Khan. Horse Lovers Connection (singles site for horsey folk!) Need I say more?